Halo Wars is a real-time strategy game for the Xbox 360 video game console. It was the last project to be developed by Ensemble Studios. The game is set in the Halo universe, 20 years before the events of Halo: Combat Evolved. The game was officially unveiled on September 27, 2006 at Microsoft's X06 Xbox show. Acknowledging that previous console real-time strategy games often fell short, Ensemble built Halo Wars specifically for the Xbox 360's limited controller. The game was an attempt to bring together Halo fans and experienced players of strategy games. While Ensemble was dissolved prior to the title's release, a company formed by many of Ensemble's former employees, Robot Entertainment, continued to support the game with updates and downloadable content. 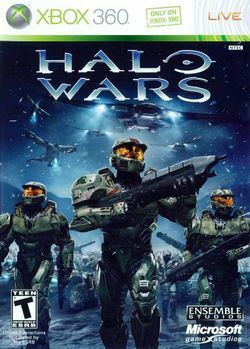 On release, Halo Wars was met with generally positive reviews from gaming critics. Critics lauded the game's attention to the Halo universe along with the intuitive control scheme. Several critics also noted that seasoned real-time strategy players may not find the strategic elements as deep and that there were no options to play as the Covenant or Flood in the game's campaign mode. The game sold one million units worldwide by mid-March 2009, making it the best-selling console real-time strategy game to date. Halo Wars takes place in the 26th century in the Halo universe. In 2525, humanity was attacked by a collective of alien races known as the Covenant. The Covenant declared humanity an affront to its gods, the Forerunners, and has aggressively waged war against the humans since. The game takes place in the year 2531, roughly 20 years before the events of Halo: Combat Evolved. Halo Wars opens on the human colony world of Harvest, six years after the planet was invaded by the Covenant; United Nations Space Command forces are still engaged in bitter conflict with the Covenant on the ground, and the UNSC ship Spirit of Fire is sent to investigate why the Covenant is still interested in the planet. This page was last edited on 26 August 2016, at 11:33.